The Wetlands Institute's New Jersey Junior Duck Stamp Contest had 36 winner statewide — including 11 from North Jersey. All 33 are on display through the end of January in the Flyway Gallery in the Meadowlands Environment Center, but we thought we'd give you a preview of the ones from North Jersey — and a chance for you to let us know which ones you like best. 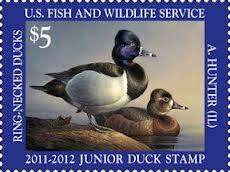 The link to the current National Junior Duck Stamp contest is here. Link to the Wetlands Institute's Duck stamp webpage is here. Please post your vote for first (and second and third place if you like) by posting by the illustration number in the comments section below, or email Jim Wright at jim.wright@njmeadowlands.gov. Remember: All 11 were among the top 30 in the entire state, so you are voting for the best of the best. Congrats to all of our local artists! The 11 from North Jersey follow, in no particular order (so as not to influence your vote! ).